Rahman sir told me to sing in a track for a collaboration that he was doing with the very famous Egyptian Composer Hossam Ramzy, many moons ago. And though it may be strange I got to know via a tweet that the album is set to release and Cairo to India carries my name in the credits. To be credited in an ARR collaboration is humbling for me. And a reaffirmation of what my mom has been putting into my singing and helping me grow as a musician and an artiste. The gratitude to Rahman sir keeps piling up though. There have been days when tears have flown freely due to various reasons. Anger has been one of them. Frustration another. Sadness yet another with regard to my career. But if there has been one person who has believed in me for whatever 2 pence I was worth, it has been Rahman sir. From the day of the recording of Dheivam Thandha Poove during my board exams to now, almost a decade has passed. But when I enter the studios today, I am still the child that I was. Time and again have I said, that he was our beacon of hope at the end of a dark tunnel, a ray of hope to a harassed single mom. And a girl who also had begun to question what's the point of living an honest life? Not to mention that the question hadnt been raised more in the recent past but the thing is I have been cast in a way. The die was made in a certain way. The mould cannot change neither can the impression. More than anything else, I live my life today, in gratitude for the food on my plate. All thanks to that first song that Rahman sir gave and continued to, when it was the era of the kuthu songs, when no one thought it was 'right' to make me sing a Kuthu song. Kept a wilting creeper alive through all those days. Angels do walk the earth. The maseeha I know is Rahman 'anna'. The way I called him the very first time I entered his studio and he chuckled at that naive 15 year old. There is nothing that someone like me can give back to him or his family except wish and pray with all our hearts, like millions of his fans, that he be healthy and spiritually protected. And today I send my thanks to the God above for giving us hope in life. And if you are at this point where a lot of things seem hopeless, I wish for you that you may find the hope that I eventually did. My mom waited almost 50 years for that. I waited a mere 14. Eventually there is light at the end of the tunnel. Read a quote recently by Robin Sharma... "Son when you were born, you cried while the world rejoiced. Live your life in such a way that when you die the world cries while you rejoice". "There is nothing that someone like me can give back to him or his family except wish and pray with all our hearts, like millions of his fans, that he be healthy and spiritually protected. " VERY TRUE!! WOW! that was Touching Chin...& Wish U & Ur Mom the Best for the times to come. you and your mom are the symbol of hard work and achievement.often I am telling about u to my daughter. I understand that you have crossed number of hurdles. god is there with u. I wish you a long musical journey. that was indeed a touching post. it has never ceased to amaze me when i hear of stories where one person changed the world to someone else; that they could mean *so* much to someone. the last line of the post, is certainly THE punch line, and i wish you had made it bold, or added some kind of stress.. I look at your post like a Omen, a sign of better things to come. I am this stage, where all my work seems to go to waste because someone wasn't honest enough and I was blind to believe what they said(they lied on paper also). It was touching me a lot. I am hopeless, sad, frustrated with this way life is going for lost 2-3 years. Winding time a lot. You are a great person to learn many things. Especially when it comes to multitasking, I admire you a lot. Thanks and prayers to Rahman Ji for introducing talents like you. Will take this as a starting point to get back to my rhythm. A truly heartfelt blog post!! Congrats!! Great post chinmayi. Its very important to remember where we come from and thank everyone who has been responsible in shaping our career. You are only of the very few people who does it promptly. May only happiness come to you. Very touching post! What beautiful words! Your heartfelt gratitude is extremely pure. 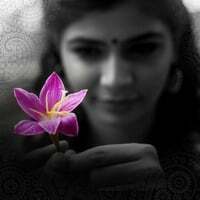 God bless you and your family, Chinmayi and may God and ARR sir continue to bless you and yours forever. You are so talented and I just wish for your musical career to soar to new heights! Just one word - Touching! Your post really shows what kind of person you are. After growing bigger, Many of us forget who helped us at the initial stage when we were struggling. You still appreciate and show gratitude towards Mr. ARR. Appreciate it :-). It would be good if you can write some post on how you chose Entrepreneurial path. Will surely be inspiring as I too chose Entrepreneurial path despite come from middle class background. As I said in my mail once, you just INSPIRE me to a different level. God bless you, your Amma and ARR!! Thanks for the post. I am in such a situation for the past few years [atleast from the time I started understanding the world], but your post(s) are giving me HOPE I can do [am capable of doing] many things. One question: I know that your life changed entirely after the track "DEIVAM THANTHA POOVE" you sung for AR Rahman. I hadnt read or heard from your interview about Ilayaraja who is one of the most iconic music directors or MSV. Both MSV & Ilayaraja had changed the music industry with their tracks. Do mention about them [I mean your opinion] Not sure if you have sung for Ilayaraja or MSV. a heartfelt post, am really melted whn reading this. best wishes for your future achievements. It is in dreaming the greatest dreams,seeking the highest goals that we build the brightest tomorrows. May all the talents you possess bring you joy and true success in each and every goal you strive to meet. And may you find that life will bring every bright and special thing to make your days fulfilling and complete. & a big thank u to all of you for bringing in some beautiful music into our lives and gifting us a smile once in a while!!!! Wow . . After a very long time something you have written with open heart . . Always inspiring to read what you write . Ya there is a ray of hope end of the tunnel. Dye and mold came from ice cream making is it ? Thank you for this post.It just about made my day. Your last sentence in this blog, 'Eventually there is light at the end of the tunnel' reminds me of Dr.Brian Weiss' words. I hope you have read his works. I have recently started recognizing your voice and have become a huge fan (as I live in the US, am a few years(!) behind with the latest in Chennai). I love 'oru deivam thantha poove' and am now listening to 'vaarayo vaarayo' in a loop. Great voice and am so happy to hear someone sing in Thamizh without murdering the words and I can actually understand every single word. Keep up the good work, and the inspiring words. I had posted earlier on Google+ asking for why you hadn't written in so many days... You said that you need to be inspired... Truly, it was worth the wait... Thanks for the Inspiration... God Bless You.. Some time back, I had written on Google+ asking you why you hadn't written in so long to which you had replied that you needed inspiration. Truly, it was worth the wait. Thanks for the inspiration. God Bless You!